“Before there was CGI, there was Andre The Giant.” So says David Shoemaker, wrestling historian, trying to describe what it was like for audiences in the 1970s the first time they saw the enormous Frenchman André René Roussimoff, either in person or on their TV sets. As Shoemaker explains in Jason Hehir’s documentary Andre The Giant—debuting Tuesday night on HBO at 10 p.m. Eastern—when Roussimoff came to the United States, televised wrestling was still a regional business, with stars who mostly stayed within a small multi-state circuit. The sports’ fans might’ve seen pictures of André The Giant in a magazine, but they were unprepared for how impressive the man could be in the flesh. He was better than any special effect. Those who knew him personally have said that hanging out with him after an event was like palling around with folklore—sort of like being friends with Paul Bunyan. Roussimoff is one of the best-known wrestlers of his era, even to people who don’t care about wrestling or who weren’t born during his all-too-brief time in the spotlight. Because of his sweetly comic performance in The Princess Bride—not to mention artist Shepard Fairey’s “Andre The Giant Has A Posse” stickers, and a handful of other non-wrestling pop culture crossovers—the image of the friendly, burly André is indelible. Hehir’s doc is mostly about how Roussimoff became famous in the first place, and the physical and mental toll it took on him before his heart gave out in 1993, at age 46. This is not a somber film, by any means, or a cautionary tale. It’s primarily a celebration of a one-of-a-kind talent, intended to put him back into his proper context. Specifically, Andre The Giant is about wrestling, and how one man helped pave the way for the sport’s 1980s boom. After a brief description of Roussimoff’s boyhood, Hehir jumps right into the ring, looking back at how a future juggernaut was discovered as a teen in the 1960s, and how he initially worked in overseas wrestling leagues as an Alpine lumberjack character, alternately called “Jean Ferré” or “Géant Ferré.” Once he made his way to Canada, he caught the attention of American promoters, who changed his name from what sounded to yankee ears like “giant fairy.” Soon he was booked as a rotating guest performer, unassigned to any one region. Shoemaker suggests that André The Giant’s strength and weakness as an attraction was his appearance. He was so unusual-looking that people flocked to gawk, but once they’d seen him, they didn’t necessarily need to come back the next night to see him again. By moving him from circuit to circuit, promoters kept the word of mouth circulating, drawing new lookie-loos. Meanwhile, Roussimoff worked the local press, becoming a household name in part by allowing himself to become a human interest story, gladly showing off his oversize body parts. At one point in the doc, Hulk Hogan enthuses that André figured out how to monetize “sports as entertainment” well before other athletes of his era did. There’s a lot of Hogan in Andre The Giant. Hehir has an impressive and on-point set of interviewees, including Ric Flair, Jerry Lawler, Vince McMahon, and legendary WWE announcer Gene Okerlund. But Hogan is so omnipresent that for a good 10 minutes of this 85-minute film, it essentially becomes a doc about the Hulkster, covering how when McMahon put wrestling on cable—right around the time Hogan appeared in Rocky III—they together turned a long-haired, sun-soaked muscleman into a national hero. This all sets up the documentary’s most dramatic moment: the showdown between Hulk Hogan and André The Giant at Wrestlemania III, after André did a “heel turn” as part of a larger plan to help his friend solidify himself as wrestling’s biggest star. Unlike other wrestling docs—most notably the at-times-annoyingly-coy 30 For 30 episode “Nature Boy,” about Flair—Andre The Giant is very open about the scripted elements and behind-the-scenes machinations of big-time wrestling. It explains how McMahon’s innovations and big personalities boosted the WWF/WWE into the mainstream, and made a lot of heavyset men very, very rich. The movie’s also upfront about the pros and cons of being André The Giant. Hehir paints his subject’s epic exploits as more awesome than pathetic, allowing his interviewees to wax rhapsodic about how André would drink a case of wine to unwind, and to note how his farting was so prodigious that he endangered his fellow passengers on small chartered flights. It says something about how beloved Roussimoff was that three of his major Princess Bride castmates (Cary Elwes, Robin Wright, and Billy Crystal) plus director Rob Reiner agreed to be interviewed for this film, even though the making of that movie only takes up about five minutes of screen time here. Yet even as his friends and colleagues are sharing their best André anecdotes, they’re noting how hard Roussimoff had it. As an adult he was diagnosed with acromegaly and chose not to take advantage of any of the available treatments because he didn’t want to interfere with his career or image. So he just kept on growing, dangerously. His size was a selling point. (Camera operators never got tired of dwelling on his massive hands, which could cover an entire beer can.) But he could never just hop into anyone’s car, or even fit into a bathroom on an airplane. He spent his final years in excruciating pain, unable to move much. 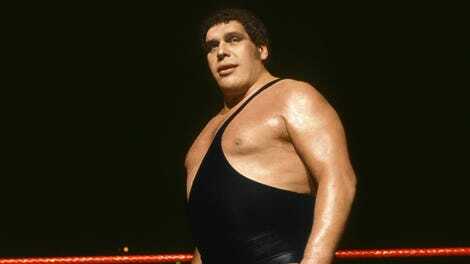 To Hehir’s credit, Andre The Giant covers all of this: from the widespread rumors that André had two hearts and two rows of teeth, to his generosity of spirit, which in this film moves even the hardened Vince McMahon to tears. And yet perhaps the most moving image in the entire picture comes toward the end, when Roussimoff’s younger brother shows the camera the gigantic chair their mother made for her special son. It must’ve been exhausting for all concerned, to have to think constantly about proper accommodations. But still, that big piece of work is something to see.